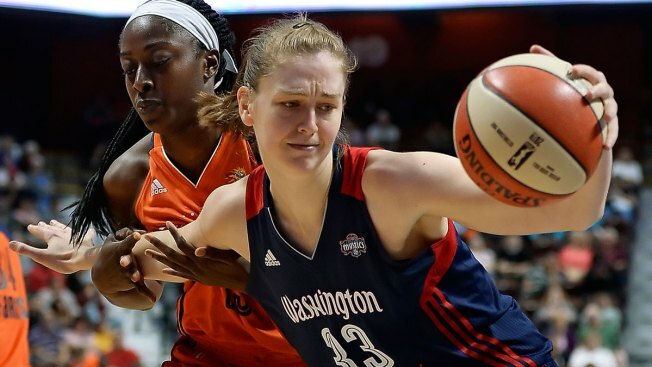 The Washington Mystics' Emma Meesseman fights for the ball in a game against Connecticut last season. A couple of Washington, D.C., sports teams are offering free tickets to veterans and members of the armed forces for Military Appreciation Day. They can get up to four free tickets to the Washington Mystics Friday game against the Chicago Sky at the Verizon Center at 7 p.m. They must be requested by 5 p.m. Wednesday here. To nominate someone you believe deserves recognition for their service, follow @washmystics on Twitter and Instagram to submit their for them to receive complimentary tickets. There will be a video tribute during the game and veterans will be encourage to participate in contests held during timeouts and quarter breaks. The Washington Valor is giving away tickets for Saturday's 1 p.m. game against the Philadelphia Soul, also at the Verizon Center. Same deadline as the Mystics: Request tickets here by 5 p.m. Wednesday. To nominate someone to receive complimentary tickets, follow @washingtonvalor on Twitter and Instagram. The Valor also will have veterans participate in contests and a video tribute.